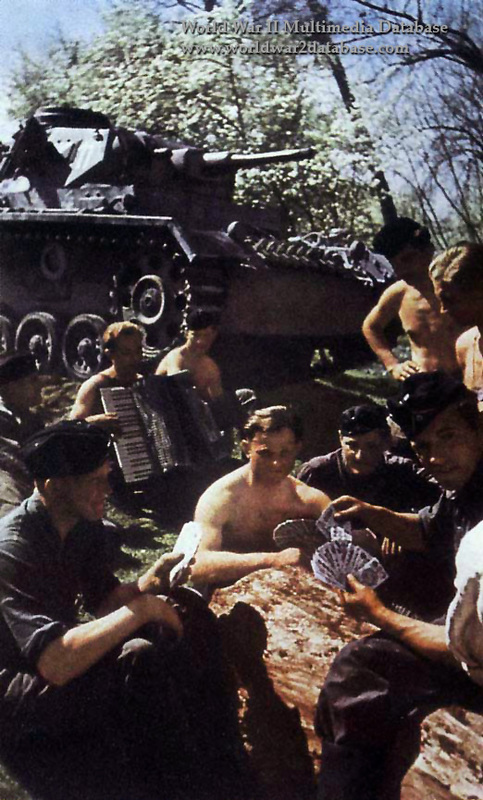 A rest break for the crew of a Panzerkampfwagen III of Twelfth Army commanded by Generalfeldmarschall Siegmund Wilhelm List during Operation Marita. Threatened by the possibility of the British entering Romania and cutting off his oil supply, and honoring the pleas for help by Benito Mussolini who had made little progress against the Greeks on the Albanian Front, Germany invaded Greece through Yugoslavia in April 1941. The invasion of Greece was the first operation in which panzer divisions and motorized infantry units were employed in distinctly alpine terrain. Despite the difficulties that were encountered the commitment of armor to spearhead an attack through mountains proved to be sound tactics. The two major successes during the first phase of the campaign—the early seizure of Skoplje by the 9th Panzer Division (April 7, 1941) and the quick capture of Salonika (April 9) byu the 2nd Panzer Division could not have been accomplished without armored divisions. The Greek command was paralyzed by the initial upsets, which were caused in some measure by "tank fright" of the rank and file soldier, as had been the case during the French campaign. The speedy capitulation of the Greek Second Army was the direct result of the sudden appearance of German tanks in the vicinity of Salonika. Unlike a few months later, when Russian prisoners of war died in captivity, the Germans disarmed the Greek soldiers and released the majority.